This truly is a 'melting moment'. That hot fudge sauce melts the ice-cream like there's no tomorrow so I had to snap these pics fast so I'd have some ice-cream left to eat. I ended up sharing this with my husband because I made it too big, sometimes my eyes really are bigger than my belly. But what's it called? 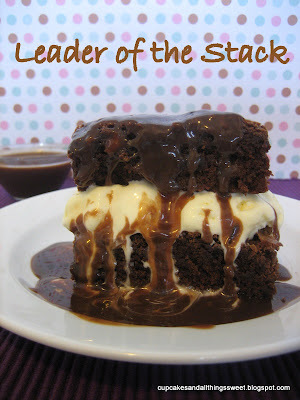 Peanut butter brownie ice-cream stack with hot fudge sauce...now that's a mouth full. Just as good by themselves. 1. Preheat oven to mederately slow. Grease 20 x 30cm lamington pan; line base and two opposite sides with baking paper. 2. Melt butter and chocolate in medium saucepan, stir over low heat, without boiling, until mixutre is smooth; cool until just warm. 3. Stir in sugar, egg and essence, then sifted flours, cocoa and extra chocolate. 4. Pour mixture into prepared pan. Drop small spoonfuls of peanut butter into the chocolate mixture and swirl through the chocolate with a knife. 5. Bake in moderately slow oven for about 50 minutes or until firm; cool in pan. Cut into 24 pieces for small brownie squares, I cut mine into bigger squares for stacking ( i can't remember how many squares it made). Combine chocolate, cream and sugar in a small saucepan. Stir over low heat until mixture is smooth; bring to a boil. Reduce heat; simmer, uncovered, 2 minutes. Remove from heat. Place one brownie square on a plate. 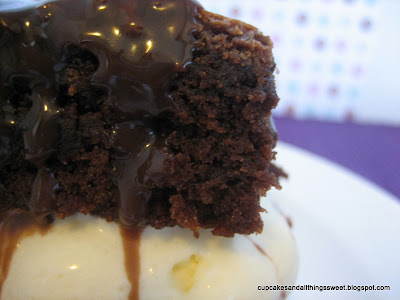 Scoop out some softened ice-cream (the amount is up to you) and spread it over the top of the brownie. Place another brownie on top. Now you can either add another layer of ice-cream and brownie or you can pour over the hot fudge sauce to finish. Wow. Can I just repeat: wow. Oh my goodness, that looks to die for! I'd like one, please. ASAP. Delicious looking and delicious tasting and quite simple to make! I've tried this with different variations. 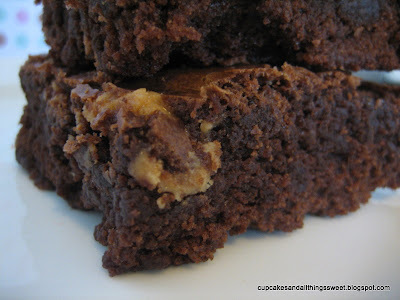 These were pure delight and I'm sure to make them again.